The full-frame sensor, usually reserved for only top-of-the-line DSLR cameras, represents the finest standard of DSLR picture-grabbin.' It doesn't come cheap. 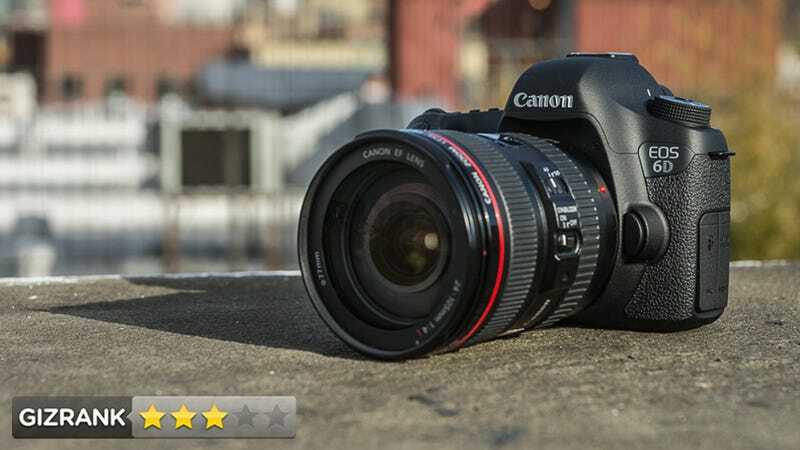 Canon fit a full-frame sensor into its new 6D—and offered camera buyers a pro-level detail at a surprisingly low price. Does it make the 6D worth buying? A wifi-equipped DSLR with a 20.2 MP full-frame sensor for only $2100—the same price as Nikon's entry-level full-frame, the D600. At the time of publication, that price was almost $1000 less than the 6D's big brother, Canon's 5D Mark III. Photographers who want the benefits of a full-frame sensor—stellar low light capability, wide field-of-view, and shallow depth-of-field—for a relatively low price. The 6D falls right in line with the rest of the Canon DSLR family. It is smaller and lighter than the 5D Mark III, and about the same size as the 7D. The biggest difference from prior models is the rear control scheme. Canon likes shifting their controls around with each model, and have continued the trend by canning the left-hand column of buttons, and re-arranging the right hand ones. The layout works for the most part, our only gripe being the control pad within the wheel, which is squishy and easy to mis-hit. Ever use a Canon DSLR? It's like that. You won't notice anything different here aside from the altered control layout. Versus the 5D MK3, the 6D has a simpler autofocus system, with 11 points instead of 61 points. But it's still fast and accurate. The 6D sports a single SDXC card slot, as opposed to the CF slots of its older siblings. The other differences are quite minor. The WiFi feature works fine, and Canon's app for iOS or Android is decent enough for controlling your camera remotely or downloading images. Oddly enough, however, video recording is disabled as soon as you turn WiFi on. This is frustrating, because using a tablet or phone as a wireless external monitor would have been a huge draw for video shooters. In comparing still image quality, we found the 6D to produce nearly identical results as the 5D Mark III—that is to say, beautiful. You will not be disappointed with this camera's terrific abilities to produce low-noise pictures at high ISOs. Sharpness is great, only slightly exceeded by Nikon's D800 or D600. Video, however, is another story. All signs pointed toward the 6D sharing the same great video quality of the 5D MK3. The thing that the 5D3 does so well—that no other DSLR has accomplished—is reducing moire patterns (rainbow-like bands along detailed surfaces). But the 6D fails where the 5D3 prevailed. Moire is rampant. This single failure ruins the 6D as a viable alternative to the 5D3 for professional video. Simple—the perks of a full-frame sensor in a slimmed-down body, and at a fraction of the price. Video quality is a huge step backward. There is now little reason to invest in the 6D over the Nikon D600, unless you're just a Canon person. Conspicuously absent is a button for directly controlling white balance. Instead, you have to access those controls through the "Q" menu on the rear of the camera. An odd choice. All sample images were shot with a 24-105mm f/4 L lens. Image samples were all shot RAW and converted in Adobe Lightroom. The body is weather-sealed for rough-and-tumble photo outings. If you are most interested in stills and don't care that much about video quality, the 6D is a great value—it produces top-notch pictures, with very few compromises, at a lower price than we've ever seen. But if you are looking for the video prowess of the 5D Mark III, plan to pony up that extra $900.